Major Tom Bird was the anti tank company commander in 2nd Battalion The Rifle Brigade (2RB) in 1942 during the North African desert campaign; he was awarded a DSO for his gallantry and leadership in the famous Snipe action at Kidney Ridge on 26/27 October during which the CO 2 RB, Lt Col Vic Turner, won a VC. 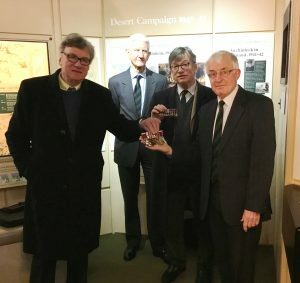 Tom Birds’ medal group of DSO, MC and Bar was donated to the Museum by his son and family. 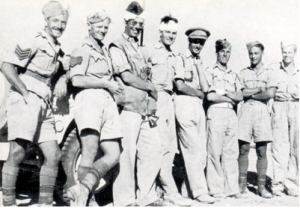 At the battle of El Alamein 2 RB was tasked with securing a ridge blocking the advance of the British armour. The Battalion moved forward 4,000 metres through extensive minefields by night to an unprepared position where, uncertain of their precise location, it took up all round defence. when dawn broke it was apparent that the battalion was overlooking an enemy leaguer and, when identified, they were attacked throughout the day by some 90 enemy tanks in successive waves. Nearly all the 6 pounder anti tank guns were knocked out and ammunition was running low for those guns that remained in action. Tom Bird and one of his platoon commanders took a jeep and drove slowly over the soft dunes from gun position collecting and redistributing rounds regardless of heavy fire from German tanks. His courage in enabling the remaining 6 pounders to stay in action was instrumental to the position being held. When 2RB finally withdrew from the Snipe position under cover of darkness during the night of 27 October the Battalion had knocked out 32 German tanks and 3 self propelled guns. Officers and men of 2 RB after the Snipe battle. Major Tom Bird is the central figure with a bandaged head.